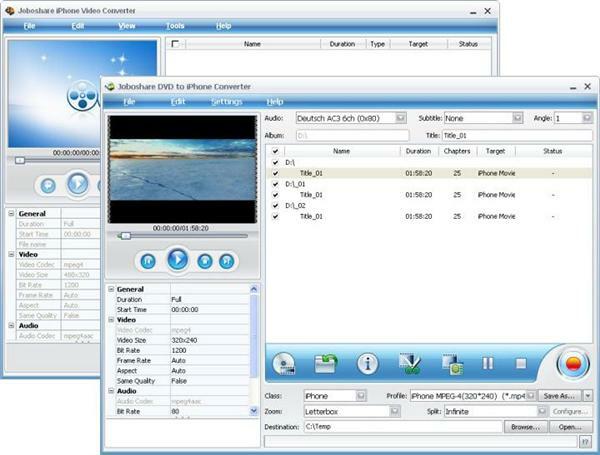 Joboshare DVD to iPhone Bundle is an all-in-one and easy-to-use iPhone video conversion solution. The Bundle includes iPhone Video Converter and DVD to iPhone Converter. DVD to iPhone Converter can rip DVD movie to iPhone MPEG-4, widescreen iPhone MP4 and iPhone audio MP3, WAV, M4A. And iPhone Video Converter lets you easily and quickly convert all popular video files to iPhone, iPod, and Apple TV audio formats MP3, M4A, WAV with high quality. ...... audio to iPhone music MP3, WAV, M4A (MPEG-4 audio) files. And Joboshare iPhone Video Converter converts all popular video formats including Windows Media Player (WMV), Real Player (RM, RMVB), QuickTime (MOV), VCD (DAT), DVD(VOB), MPEG, Youtube (FLV), AVI (DivX, XviD), etc. to iPhone movies MP4, widescreen iPhone MP4, iPhone 3G MP4 video or iPhone 3G H.264 video. 1. Convert DVD and video files to iPhone, iPhone 3G, iPod touch, iPod nano and Apple TV. 2. Joboshare DVD to iPhone Bundle = Joboshare iPhone Video Converter + Joboshare DVD to iPhone Converter. Rips DVD and converts audio to iPhone MP3, M4A, WAV. 4. Convert audio formats to iPhone. 5. Extract audio from movies or music videos and enjoy on iPhone. 6. Support iPhone and iPhone 3G. 7. Fully support dual-core and multi-core processors. Qweas is providing links to Joboshare DVD to iPhone Bundle 2.7.9.0214 as a courtesy, and makes no representations regarding Joboshare DVD to iPhone Bundle or any other applications or any information related thereto. Any questions, complaints or claims regarding this application Joboshare DVD to iPhone Bundle 2.7.9.0214 must be directed to the appropriate software vendor. You may click the publisher link of Joboshare DVD to iPhone Bundle on the top of this page to get more details about the vendor.